Socks and shopping, oh boy! So Wednesday night I skipped quilting because I was beat from this cold I’ve got. 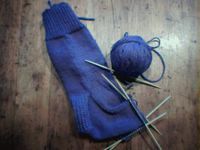 Stayed home and watched the movie Ray (it’s almost Oscar time, yay hooray) and worked on Dale’s sock. I’ve actually made a bit more progress since I took that photo, I’m now doing the toe decreases and should have it finished today. Hopefully I’ll be stopping at The Wool Patch in Middleboro on my way home from work today to pick up another skein of green and black to finish the Alien Illusion Scarf. I’ll post again when I’m shopped out!